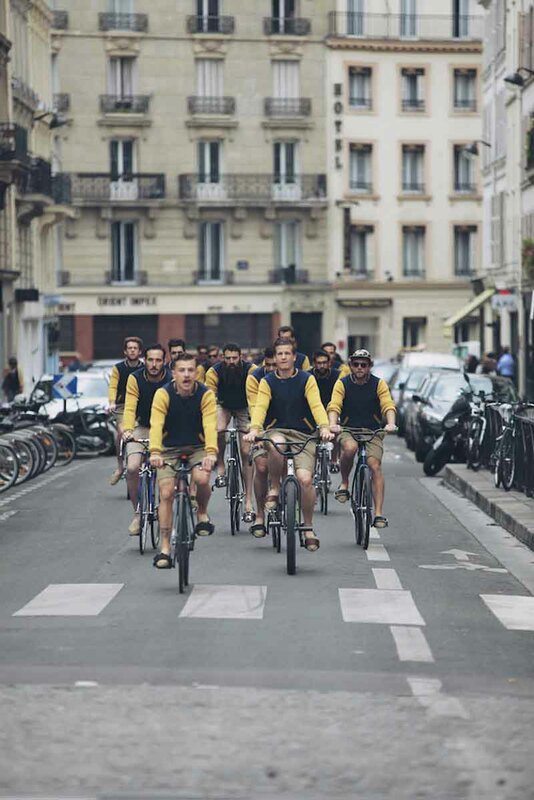 PARIS, Jul 1, 2014/ — On Saturday, Jun 28th, twenty male models wearing the blue and yellow varsity jackets rode bicycles on the streets of Paris proclaiming “Merci Monsieur Lagrange” as they heralded the Monsieur Lacenaire Spring/Summer 2015 presentation held at the end of the ride. A tribute to Léo Lagrange, French Minister of Youth and Leisure in the 1930’s, and was instrumental in the creation of paid holidays in France! Thank you, indeed! The title of the collection is fitting; the models on a bike and outdoors are a reference to Léo Lagrange’s position as Minister of Sports. The ride finished at Monsieur Lacenaire’s new store at rue Charlot where models dressed in the Spring/Summer 2015 collection posed for editors and photographers.